The Iranian refusal to abide by UN Security Council (UNSC) resolution number 1696 has complicated the crisis that has arisen out of Teheran’s nuclear ambitions. IN a way, coalitions are marriages of convenience, which remain stable only until such time as all parties are committed to keep them going. Jammu and Kashmir is no exception. That the tiger in particular and wildlife protection in general have suffered from inefficient administration and corruption was clear from what has been happening in the Sariska and other sanctuaries over the years. LET those who want to hurt us by inflicting a thousand cuts remember - no one can break our will or unity. No one can make India kneel.” This is how the Prime Minister Manmohan Singh expressed the nation’s resolve to counter terrorism on August 15. What happened to Lover’s Lane? The walls have risen to the height of a fort,” said Jai Pratap Singh, looking out of the car window towards the boundary wall adjoining the hostel of Government College for Girls, Sector 11. Nirmal Sandhu visits Patiala’s Rajindra Hospital, where animals stray into the emergency ward and a shortage of space, staff and equipment can result in fatal delays in treatment. After decades on the sidelines, U.S. defense contractors are eyeing India’s growing military budget and aging arsenal as a multibillion-dollar opportunity that could help offset a projected slowdown in Pentagon weapons spending and extend production lines for such items as the F-16 fighter. The Iranian refusal to abide by UN Security Council (UNSC) resolution number 1696 has complicated the crisis that has arisen out of Teheran’s nuclear ambitions. The resolution wanted Iran to suspend uranium enrichment by August 31 or face economic sanctions, but Teheran has ignored it, saying that it will “never renounce peaceful nuclear energy and its absolute right to nuclear energy.” This is despite the fact that Iran is not opposed to further talks. US President George Bush has reacted to the Iranian defiance on the expected lines: let Iran face the “consequences”. Washington’s stand is that since there is a clearly negative report from the International Atomic Energy Agency submitted to the UNSC on Thursday and the world nuclear watchdog is unable to establish the “peaceful nature of Iran’s nuclear programme”, there must be “consequences for Iran’s defiance”. However, this is not what all of the Big Five — the permanent members of the Security Council — plus Germany want. The stand of Russia and China is well known. They are against any punitive measure like economic sanctions and would prefer the Iranian nuclear crisis to be settled through diplomatic efforts. What is interesting is that France and Britain too are not for closing the door to negotiations, though they are in favour of the sanctions. In any case, no action is likely immediately as the UNSC will meet to discuss the imposition of sanctions, and the deliberations may continue for some time. European Union foreign affairs chief Javier Solana, too, is scheduled to hold discussions with Iran’s national security chief Ali Larijani in a few days. As the situation stands today, there is a strong opinion in favour of defusing the crisis through negotiations. Of late, President Bush, too, seems to have undergone a change of heart as his latest statement has it that “We will continue to work closely with our allies to find a diplomatic solution …”, but “we must not allow Iran to develop a nuclear weapon”. Whatever steps are taken should not block the road for further talks. Nothing should be done in haste. International diplomacy is faced with a serious challenge and it must be given the maximum opportunity to produce the desired results. The hardening of attitudes on either side can only further exacerbate the crisis, which is not in the interest of global peace and progress. IN a way, coalitions are marriages of convenience, which remain stable only until such time as all parties are committed to keep them going. Jammu and Kashmir is no exception. But here the glue holding together the Congress and the People’s Democratic Party (PDP) has come to breaking point following the decision of the latter to remove Deputy Chief Minister Muzaffar Hussain Beig from the post of Leader of the PDP Legislature Party. He had come in direct conflict with former Chief Minister Mufti Mohammad Sayeed and his daughter and PDP president Mehbooba Mufti. The PDP was finding to its chagrin that he was acting more like a member of the Congress party, and even praised Chief Minister Ghulam Nabi Azad when the other PDP leaders had strongly criticised him. The PDP wanted to cut him to size, and recommended that he be given less important portfolios — Tourism and Housing and Urban Development—instead of the existing charge of Finance, Planning, Law and Parliamentary Affairs. The refusal of the Chief Minister to do so precipitated the crisis. The PDP is in a peculiar position. It wants to wield power and at the same time does not want to identify itself too closely with the Congress party. So, like the Left at the Centre, it takes potshots at the government every now and then. The PDP is also aggrieved that the Congress is poaching its men. The perception is that Mr Beig might have been won over by Mr Azad. That kind of attrition and the suspicion can wreck the coalition and make things more difficult in the border state which already has its bag of problems full. As a minister Mr Beig has shown himself to be competent and this tug of war may tell on the efficiency of the Azad ministry. Ironically, Agriculture Minister Abdul Aziz Zargar, whom the PDP proposed as Deputy Chief Minister in Mr Beig’s place, is under a cloud ever since terrorists involved in the attack on the Akshardham temple in Gujarat disclosed to the police that they had hatched the conspiracy in his village house. Even if Mr Azad is willing to sacrifice Mr Beig to keep afloat his ministry, he would find it difficult to justify taking in Mr Zargar in his place because of the taint. That the tiger in particular and wildlife protection in general have suffered from inefficient administration and corruption was clear from what has been happening in the Sariska and other sanctuaries over the years. Project Tiger was launched a few years ago with much hope and fanfare, but it has not helped save the endangered species. The Comptroller and Auditor-General’s latest findings tabled in Parliament suggest that even the much-touted early successes of Project Tiger are an exaggeration. An increase of just 20 tigers, in 18 years, in 15 tiger reserves under the project, is hardly a figure the government can be proud of. Such a failure, in fact, may lie at the heart of the reason why many believe that the number of tigers in the country today may have halved, from about 3000-3500 to about 1200-1500 during the last tiger census in 2002. In the regions under Project Tiger, the CAG says that the tiger population rose to 1141 from 1121. Everything from adhocism, failure to enforce laws, flawed planning, monitoring of reserves, and census methods have been criticised. Similarly shown up were measures against poaching, and deficiencies in equipment, manpower, intelligence gathering and prosecution of wildlife crimes. A much-touted tiger count was undertaken last year, after the Sariska scandal, which exposed how tigers were vanishing. The government is now engaged in an exercise to obtain accurate figures of the tiger population. The Tiger Task Force 2005 was marked by divisions with dissenting member Valmik Thapar protesting against the lopsided focus of the report, arising from a needless “people vs tigers” approach. Even the latest wildlife act amendments, taken in conjunction with the Tribal Land Rights Bill, which enables redistributing of forest land to tribals, will have an impact. Against poaching, however, there cannot be differing views. Apathy and corruption will have to end, and the government must give the wildlife department the necessary weapons, communication equipment, manpower and training. The tigers which are living must be saved. Life is a series of experiences, each one of which makes us bigger, even though sometimes it is hard to realise this. A tough message perhaps it was. The Israeli PM also gave a tough speech on July 31. He said: “We will not hesitate, we will not apologise and we will not back off…we will continue to bomb…today, tomorrow and the day after tomorrow…here, there and everywhere”. May be our culture is different and therefore our response is comparatively subdued. But is there a threshold of tolerance for us or is it ad infinitum ? Jehadi terrorism, which was hitherto confined by and large to Jammu & Kashmir has gradually spread its tentacles all over the country. Delhi and Mumbai have been marked targets of the terrorists for obvious reasons. No place is beyond their reach and even the holy places have not been spared. Ayodhya and Varanasi witnessed terrorist attacks. The objective of the terrorists is not only to destabilise India, subvert its economic progress and vitiate the communal atmosphere but bring it under the Nizam-e-Mustafa. A very determined and firm response is obviously called for. Half-hearted measures will not do. The following measures, it would seem, are absolutely essential if we are to win the war against terror. We need to define our policy on the subject. It is inexplicable that even though we have been facing the problem of terrorism for the last nearly 50 years, we have not cared to define our response to it. The US, which felt the impact of international terrorism only in the current millennium, has a well-defined policy, the essential ingredients of which are : no concession to terrorists, bring them to justice for their crimes, apply pressure on states that sponsor terrorism and bolster the counter-terrorist capabilities of friendly countries. It is time that we also codified our policy. The National Security Council should be entrusted with this responsibility. The country needs an anti-terror law. It is unfortunate that POTA was allowed to lapse and the law-enforcement agencies have to deal with terror without any anti-terror law. The Unlawful Activities (Prevention) Act is hardly a substitute. Those who argue that the existing laws are adequate are deluding themselves and misleading the policymakers. The countries from where we derive inspiration for our democracy have gone ahead with stringent laws following the threats they found themselves confronted with. The US has the Patriot Act which gives sweeping powers to the law-enforcement and intelligence agencies. UK’s Anti-Terrorism Act, 2006 makes it a criminal offence to glorify acts of terrorism, training and preparing for terror activities or disseminating related publications. The Act even enables authorities to detain terror suspects up to 28 days. India does not need another POTA - but something tougher than that! The police is our main instrument to fight terror. It is essential that it is energised to a level where it is able to deal with the terrorist threats. For this, we shall have to insulate the agency from political pressures. It should be able to function with full operational autonomy. At the same time, it is imperative that terrorism, along with other organised crimes, is placed in the category of “Federal Crimes” and the investigation of these offences is statutorily entrusted to the CBI, which would in the process have to be expanded substantially. The reorganisation of intelligence which should have taken place in the wake of Task Force recommendations has, unfortunately, not happened yet and there are inter-agency conflicts. These must be addressed on a priority basis and the revamping undertaken. The IB also needs to be de-politicised in the sense that it should concentrate on matters relating to internal security and not fritter away its energies on collecting information about the opposition parties. R&AW should be given specific targets in countries which are trying to bleed India. Some organised gangs came to adverse notice in 1993 and these are believed to be working against the country even today. It is time their assets were confiscated and their infrastructure and support bases destroyed. The laws relating to the acceptance of foreign exchange remittances from abroad are far too liberal. Huge sums of money are legally flowing in - apart from hawala transactions and the circulation of counterfeit currency. These must be plugged. The ISI has been trying to subvert our economy by pumping in huge sums of counterfeit currency. Possession of such currency beyond a limit, say five lakh, should invite capital punishment/ life imprisonment. The Ministry of Home Affairs also needs to be reorganised. Earlier, we had a Minister for Internal Security who concentrated on the operational aspects. Some incumbents (Chidambaram, Pilot) served in that capacity with great distinction. It is time that a specially chosen minister was given charge of Internal Security in the MHA. It is central to any counter- terrorism strategy to make enemies of the nation realise that terrorism will not pay. The message will have to be driven home to the state sponsors on both the flanks, and unless we do that they would not abandon the game they have been merrily playing all these years. We may not retaliate like Israel, we may not cross the LOC, but some latitude will have to be given to the security forces and the intelligence agencies. Risks shall have to be taken. What is at stake are not some lives or buildings or vital installations - but peace and stability of the country, its economic progress and the communal bonhomie. Will the political leadership of the country rise to the occasion and evolve a consensual and yet firm response to the menace of terrorism? Or would they wake up only after a horrendous tragedy overwhelms the nation? What happened to Lover’s Lane? The walls have risen to the height of a fort,” said Jai Pratap Singh, looking out of the car window towards the boundary wall adjoining the hostel of Government College for Girls, Sector 11. We were last week crossing the road dividing Sectors 10 and 11 in Chandigarh at around 10 p.m. Formerly known as Lover’s Lane among college boys, the road stretch has hostels of GCG and Home Science for Girls and Government Polytechnic for Women. “Law has controlled all nocturnal play”, I smiled looking at the face of my friend visiting me after 15 years. A student of DAV College, Sector 10, in late 1980s, he is currently a senior manager in a multinational based in New Zealand. He had been a ‘Hero of the Night’ when the boundary walls here were much lower and there was no barbed wire on the wall boundaries. When he was a fresher in Plus One, he made friends with certain seniors who were regular visitors to the Lover’s Lane at night. The exercise would start around 10 p.m. when a few groups of boys from DAV and GCM, Sector 11, would jump the college gates on to the roads. Each group would then keep certain distance among themselves during their travail in the Lover’s Lane. Jai was always very excited next day to fill me with the details of the latest episode in the “ jhoot mooth romance serial”. “I am a big hit in the lane. Seniors have picked me in their team because I play melodious tunes on a flute which are appreciated by the girls”’ he boasted. “How can the girls be talking to strangers?” I asked him. “Very simple. They don’t tell us their real names. Nor do we. We know them by the name of Rosie, Suzie, Mona and Sona. They know us by names of Arnold Schwarzenegger, Sylvester Stallone, Chuck Norris, Tom Cruise and Marlon Brando. None of them recognises us or, at least pretends not to, in case they see us in the daylight,” he said. We parked in the market of Sector 10. We looked straight into face of a Police Inspector, when we alighted from the car. His eyes narrowed and he chuckled “Oye, mere Kishan Kannahiya, do you still impress the gopis with your flute”. He recognised Jai because one night Jai was picked by his party while playing one of his tunes sitting on a tree adjoining the hostel wall. Next morning when we went to get him back from the police station, Jai was basking in the winter sun in the compound of the police station and playing the ‘super-hit’ tune of “Hero” much to the delight of the cops. 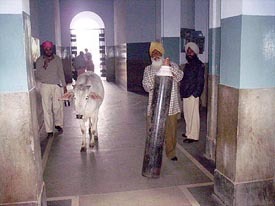 A cow near the Emergency Ward No 1 at the Rajindra Hospital at Patiala, on Thursday. — Tribune Photo by Rajesh Sachar. If you are a patient and rushed to Patiala’s Rajindra Hospital, chances are you may not find even a stretcher or a wheeled-chair to reach the emergency ward. You may count yourself lucky if the lift is working. An accident victim with a plastered leg from Sangrur district had to wait for three hours in the van before his attendants could lay their hands on a wheeled-stretcher so that he could be taken for an x-ray. This happened a few days ago. When Municipal Corporation union leader Harjit Singh was brought to the hospital after an acid attack, he was not immediately attended to. As a result, he died. The matter would have ended there but for the fact that his colleagues protested and the issue made headlines. A three-member inquiry committee found “an inexcusable delay” in the treatment of Harjit Singh. The health authorities transferred the four doctors handling the case out of Patiala. The Principal of Government Medical College and Rajindra Hospital, Dr Kiranjit Kaur, and the Medical Superintendent (MS), Dr Kulbir Kaur, too were shifted despite the fact that both were on leave then. Realising the action was ill-advised, the authorities cancelled their transfer. The four doctors too were later brought back. Serious patients brought to Rajindra Hospital are at risk as delays in treatment — for whatever reason — can be fatal. It may not be because the paramedic staff or doctors are negligent. There are too many patients, more than the given space, staff and equipment can handle. Mr Subodh Kumar of Sulabh International was perturbed by the lack of sanitation in the hospital and saw the possibility of diseases spreading due to lack of hygiene. He had another grouse: some senior nurses are arrogant and unhelpful. The hospital sanitation work is divided between the regular and contractual staff and the latter are doing their job better. Incapable of disciplining the permanent sweepers, the authorities patiently wait for their retirement to outsource the entire sanitation work. As I was having a round of the hospital, I saw class IV employees being told to leave their work and gather in a corner. “Is there a strike”, I asked an employee who turned out to be a leader. Mr Rooplal Bagha clarified, “We are having a get-together to welcome a leader of the Patiala Municipal Corporation”. Despite the user-charges, the quality of service has not improved. Better-off patients turn to private clinics and hospitals. “User-charges are very nominal compared to what private hospitals charge. The hospital collects Rs 70 to 80 lakh from patients in a year. The government should waive the charges,” suggests Dr Kiranjit Kaur, Principal of Government Medical College and Rajendra Hospital, who also holds additional charge as Director, Research and Medical Education. The rising cost of treatment is worrying patients the most. The worst hit are the elderly without any pension or facility for reimbursement. Dr Kulbir Kaur, Medical Superintendent, suggests the poor should be given a medical insurance cover on a nominal payment and adds the government is already toying with the idea. “The prices of medicines have risen so high, how can the government bear the burden of treating every patient? Only 10 per cent patients get free treatment,” she noted. There have been reports in the media of ambulances lying idle for want of petrol and the hospital being without sufficient cotton, disposable syringes and bandages, but the Principal dubs such reports speculative. The hospital building is dilapidated. A number of patients and their attendants complained about toilets being intolerable. In the absence of a proper boundary wall, stray cattle and dogs move in and out. As the space outside the hospital has been raised by dhaba-owners, rainwater flows in and the drainage system proves inadequate. Dr Kiranjit Kaur is aware of these problems. Denying there is any shortage of funds, she says she has got Rs 7 crore from the government and renovation work will be taken up soon, particularly of ward and OPD toilets and the boundary wall will be completed. An advanced trauma care centre is being set up in the hospital. The Chief Minister has given Rs 1 crore for the centre. The Alumni Association and the US-based Patiala Health Foundation are raising funds. They held a meeting in Chicago recently and collected Rs 1.12 crore. Such voluntary efforts are commendable, but the money is still not enough as the trauma centre is estimated to cost Rs 40-50 crore. It is learnt that the hospital had sent a proposal to the government for Rs 35 crore for renovating the building and constructing new blocks as also for buying equipment. The Chief Minister promised Rs 25 crore to the college, which falls in his hometown and is named after one of his distinguished ancestors. But the bureaucracy scuttled the demand on the ground that the other medical colleges in the state too would ask for similar grants. That only shows health is not a priority for the tight-fisted government as for as resource allocation is concerned. There is need for decentralisation of powers. A medical college principal in Punjab can make emergency purchases worth Rs 1 lakh only, while the amount is Rs 15 lakh for the Principal of Government Medical College and Hospital, Sector 32, Chandigarh, and Rs 12 lakh for the head of the Rohtak PGI. Staff shortage is acutely felt and the situation is set to worsen. “Hospitals cannot be run on paper,” commented one teacher. The Patiala Medical College alone will be short of 56 teachers by December 31, 2007, due to the retirement of faculty members and lack of induction of fresh teachers. “A medical teacher has become a rarity”, observed the Principal. To cope with the situation, she suggests the retirement age of teachers should be raised from 58 to 62 as the neighbouring states and Chandigarh have done it. Besides, the 25 per cent quota of the posts filled through the Punjab Public Service Commission should be abolished and the vacancies filled by promotions only. India has been effectively closed to U.S. defense firms since the 1960s, initially because of its ties with the Soviet Union, and later under formal sanctions imposed in response to nuclear weapons tests in 1998. Those sanctions were lifted in 2001, a decision given impetus by the Sept. 11 attacks and the growing strategic alliance between the two countries. Several of the Pentagon’s largest contractors, including Lockheed Martin Corp. and Boeing Co., have either opened new offices or beefed up existing ones in India and are part of an industry-wide wooing of military officials and business leaders there. Sikorsky Aircraft Corp., maker of the Black Hawk helicopter, opened an office in India in April and is competing for a contract for 200 helicopters potentially worth more than $3 billion. General Dynamics Corp., based in Falls Church, Va., bought an Indian company in 2004 and is using it to sell communications equipment. The Aerospace Industries Association, a lobbying group, is planning a trip there in December with executives from up to 20 companies. “The bi ggest hurdle is going to be patience,” Torkel Patterson, president of Raytheon International Inc., said of joining the market. “We’re getting to know each other.” The company is hoping to sell Patriot missiles to India and to help it upgrade its missile defense system. At stake are contracts worth billions from a country with expanding economic and strategic ties to the United States. While not the largest foreign defense market, industry officials and analysts consider it one of the fastest growing as it replaces fleets of Soviet-era planes and goes shopping for new radar and missile systems. India’s defense budget is expected to reach more than $23 billion this year, compared with about $13 billion in 2000, according to Teal Group Corp., a Fairfax, Va., research firm. “It’s an untapped market that nobody has the inside track on yet,” said Joel Johnson, a Teal Group analyst. “The Indians have money, their economy is growing and, so, U.S. companies are guessing that when our own defense budget finally gets crunched” the Indian market will be profitable. Even after the arms embargo was lifted, hurdles to doing business remained. Indian officials worried that if the relationship soured again they could be left without critical spare parts, analysts said. Last year, however, Indian Prime Minister Manmohan Singh and President Bush signed a joint statement that envisioned more defense cooperation and exchanges of technology. That, combined with White House and congressional support for the sale of nuclear technology to India, has made defense contractors confident that business will pick up. “India is clearly a nation we think we can build a lasting relationship with,” Lockheed chief executive Robert Stevens said in a speech in London. Lockheed got a “toe” into the Indian market this year when it was hired to supply parts for submarines. “It’s modest, but part of confidence building,” said Ron Covais, Lockheed’s vice president for corporate international business development. Developing a significant presence in India will not be easy. The country has traditionally bought its weapons from Europe or Russia and has a complicated and lengthy procurement process, industry insiders say. “The cost of marketing could equal 5 to 10 percent of contract. You’re looking at a lot of upfront costs,” said Richard Aboulafia, an aviation analyst for Teal Group. Critical to any contract, industry officials acknowledge, will be partnerships with Indian businesses. The Indian government is expected to require contractors to do about 30 percent of the work in the country, aiding local businesses and ensuring that they will have access to critical technologies. Northrop Grumman and Boeing sponsored an event on the topic last month, drawing more than 300 attendees, including India’s defense secretary, Shekhar Dutt. Tata Group, a $42 billion Indian conglomerate, receives several calls a month from defense contractors considering partnerships, said David Good, the company’s North American representative. The largest near-term opportunity is India’s plan to buy 126 fighter aircraft. “That will be the bellwether,” Teal Group’s Johnson said. By hanging Zulfikar Ali Bhutto on the charge of having plotted a political murder Gen Mohammed Zia-ul-Haque has complied with the letter of the law of the land as interpreted by the Supreme Court, but his action will stand extensively condemned as a vengeful defiance of civilised norms in a large part of the world. This is undoubtedly Pakistan’s foulest hour. Zulfikar Ali Bhutto was far from a clean politician. He was a long distance removed from the principles of fair play or the democratic practices about which he glibly talked on many occasions. When he got the chance he dealt with his political opponents and enemies without a qualm of conscience “—” witness his behaviour in the North-West Frontier Province and Baluchistan. He was an opportunist and a liar, and his overpowering ambition to become the number one man in Pakistan was at least partly responsible for the creation of Bangladesh. It was Zulfikar Ali Buttto who, after Gen Yahya Khan had declared martial law in the then eastern half of the country, proclaimed that Pakistan had been “saved”. Bhutto was no friend of India. As recent confessions by some of his former aides have revealed, the initiative for starting the war of 1965 against India belongs to him. Had he remained in power he would probably have continued to create difficulties for India. Notwithstanding all this, the people of this country will not rejoice with Bhutto’s enemies in Pakistan over his liquidation. Most of us are so busy doing what we think we have to do, that we do not think about what we really want to do. A preceptor learns as much from the student as the student from the preceptor. When a king aspires to manorchy, he should keep away from games of pleasure like dice. The challenge of dice can corrupt the sanest mind, rob the wisest of his throne and the richest of his wealth. “Why not?” is a slogan for an interesting life. What shall we offer Him in return, so that we are blessed by His grace?